Weird outline on oem side skirts. Help! I was looking at my Z the other day when I noticed this strange outline on the oem side skirt near the rear wheel on both sides of the car. It looks as if something fits over top of the outline. I'm rocking a 2003 touring. Just curious on what this was and if any of you guys have it too. I tried to search but i didn't really know what to call it.lol any insight will be much appreciated. Thanks! Last edited by HOMiEZ; 06-07-2011 at 10:14 PM. My '08 has a slightly raised area ahead of the rear wheels. It's probably some sort of protective layer over the paint. Correct. Its some sort of film to protect against rock chips. Wish they had covered the nose and hood with that stuff. It's a lot cheaper to repaint a pair of side skirts. Haha thanks guys that's exactly what I was talking about, I appreciate the help! Mine is...... but it doesnt come cheap. what did you pay for a paint job? 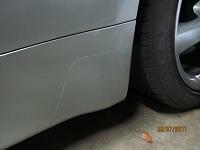 Quick Reply: Weird outline on oem side skirts. Help!